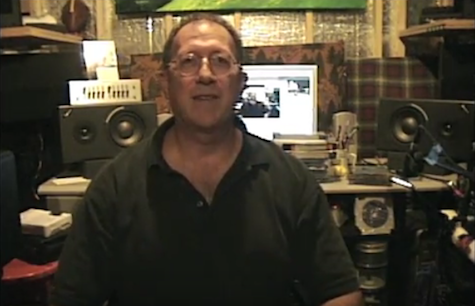 Mike Kronschnabel, a.k.a. Kronch, hosting an episode of Trout Tunes. Before I get to the weekend, some thoughts on Mike Kronschnabel, a.k.a. Kronch, who passed away yesterday. If you were kicking around the Omaha music scene in the early ’90s you knew Kronch. He was a fixture at all the good rock shows with his video crew and their tri-pods and cables and microphones positioned off to the sides of the room, out of the way but close enough to catch the action on stage. Sometimes it was just Kronch with a video camera. Either way, you knew you were in the right place that night because Kronch was there videotaping the whole thing for his cable show, Trout Tunes. We only spoke a few times when we bumped into each other at shows. He had a warm voice and a generous nature and was always good conversation because he knew his stuff and he had good taste and he was passionate about local original music. Everyone knew him and respected him because we knew he was documenting a scene that wasn’t going to be around forever. Well, more than 20 years later, Omaha’s music scene is still very much with us, built upon everything that came before it. And thanks to Kronch, we have a record of it to watch again on YouTube. Check out his channel. These days when I go to shows every time I see a gang of digital camera people (usually from Hear Nebraska) I think of Kronch, who did it before anyone else. He is missed. It’s a very limited weekend for rock shows. Tonight at fabulous O’Leaver’s Low Long Signal headlines with Tenenbaums and Mint Wad Willy. $5, 9:30 p.m. Tomorrow night it’s the EP release show for Bazile Mills at Reverb Lounge. The 4-song 12-inch I believe is the first release on new label Widmest Productions. No opener is listed. $8, 9 p.m.
That is all I have for this weekend. If I missed your show, put it in the comments section. BTW, on this inauguration day, I’m listening to Battle Hymns, a compilation album created in direct response to the current political situation in the U.S.A. It is a protest record! It was released digitally on inauguration day in opposition to the incoming administration. The album is available pay what you want at www.quasiband.com with all proceeds divided equally between Planned Parenthood, The ACLU and 350.org. Artists include Mac McCaughan, Boss hog, Stephen Malkmus, Mary Timony, Qusi, Rebeccas Gates, Dough Martsch and more. Get your copy at quasiband.com. I’m sure there will be a lot more records like this one in the coming months and years. Collect them all. Not much to report today, so I thought I’d post the latest from our friends over at Trout Tunes. If you were going to shows in the early- and mid-90s at such places as The Howard Street Tavern, The Capitol Bar and Grill, The Ranch Bowl, Sokol Underground or any of the other long-gone music venues that helped define Omaha’s golden age of indie music (before Saddle Creek reared its lovely head) you probably saw “Kronch” and his film crew capturing live performances for their Cox Cable access TV show, Trout Tunes. Well, good ol’ Kronch has been pulling together clips from his show and putting them on YouTube on a weekly basis. This week’s Trout Tunes Video of the Week features Cactus Nerve Thang live at the Capitol April 27, 1994. CNT was one of the Omaha bands that got signed by Grass Records (along with Mousetrap). 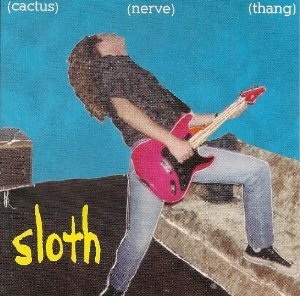 Their debut, Sloth, not only was notorious for its rabid, acidic take on punk (bordering on grunge) but for its album cover artwork, that rumor has it was loathed by the suits at the label who described it as one of the ugliest album sleeves they’d ever seen. Hey, it ain’t that bad.